A tiny accessory you can hang from the ceiling or set on a windowsill. 1. Gather your material. 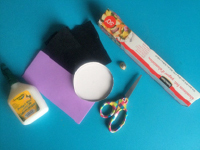 You will need black felt, a scrap of purple Fun Foam, scissors, aluminum paper, a gold button, a round cardboard box lid, and white glue and/or hot glue. 2. 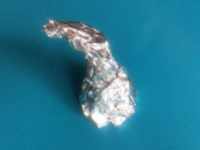 Cut a large piece of aluminum paper. 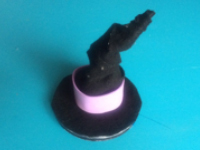 Roll it up and crumple the paper to create a witch hat shape with a pointy tip. 3. 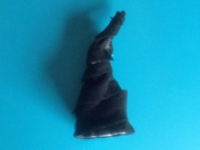 Wrap the shape with black felt. 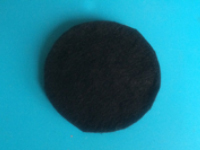 Add a few drops of glue to hold the felt in place. 4. 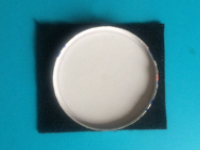 Glue the cardboard lid on another piece of black felt. 5. Cut around the contour of the lid. 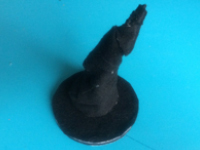 This will become the brim of your witch hat. 6. Glue the hat shape on the lid. 7. 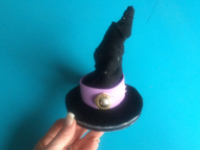 Cut a strip of purple Fun Foam and glue it around the hat, just above the brim as shown. 8. 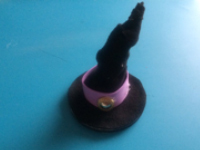 Glue the gold button on the purple Fun Foam to complete your miniature witch hat.